Sand Mandala (Tibetan: དཀྱིལ་འཁོར།, Wylie: dkyil 'khor; Chinese: 沙坛城; pinyin: Shā Tánchéng) is a Tibetan Buddhist tradition involving the creation and destruction of mandalas made from coloured sand. A sand mandala is ritualistically dismantled once it has been completed and its accompanying ceremonies and viewing are finished to symbolize the Buddhist doctrinal belief in the transitory nature of material life. Historically, the mandala was not created with natural, dyed sand, but granules of crushed coloured stone. In modern times, plain white stones are ground down and dyed with opaque inks to achieve the same effect. The monks use a special, extremely dense sand in order to limit interference by things like wind or sneezes. Before laying down the sand, the monks assigned to the project will draw the geometric measurements associated with the mandala. The sand granules are then applied using small tubes, funnels, and scrapers, called chak-pur, until the desired pattern over-top is achieved. Sand mandalas traditionally take several weeks to build due to the large amount of work involved in laying down the sand in such intricate detail. It is common that a team of monks will work together on the project, creating one section of the diagram at a time, working from the centre outwards. The Kalachakra Mandala for instance, contains 722 deities portrayed within the complex structure and geometry of the mandala itself. Other smaller mandalas, like the one attributed to Vajrabhairava contain significantly fewer deities and require less geometry, but still take several days to complete. Like all mandalas, these are meant as two-dimensional representations of what is supposed to be a three-dimensional environment. Various buildings have been suggested to be three-dimensional mandalas such as: Borobodur in Java, Indonesia, and the Bayon in Siem Reap, Cambodia, although no academic consensus on either has yet been reached. 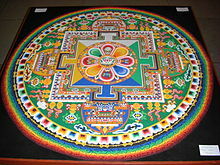 Many sand mandala contain a specific outer locality which is clearly identified as a charnel ground. The colours for the painting are usually made with naturally coloured sand, crushed gypsum (white), yellow ochre, red sandstone, charcoal, and a mixture of charcoal and gypsum (blue). Mixing red and black can make brown, red and white make pink. Other colouring agents include corn meal, flower pollen, or powdered roots and bark. The destruction of a sand mandala is also highly ceremonial. Even the deity syllables are removed in a specific order along with the rest of the geometry until at last the mandala has been dismantled. The sand is collected in a jar which is then wrapped in silk and transported to a river (or any place with moving water), where it is released back into nature. This symbolizes the ephemerality of life and the world. ^ Bryant, Barry; Yignyen, Tenzin; Samten, Lobsang; Chogyen, Pema Lobsang; Gyaltsen, Dhondup Lobsang; Lhundup, Jamphel; Migyur, Tenzin; Legdan, Tenzin; Gyaltsen, Lobsang; Kirti Tsenshab; Moldow, Deborah; Durgin, Gregory (2003) . "X et. seq.". Wheel of Time, The: Visual Scripture of Tibetan Buddhism (2nd ed.). Ithaca, NY: Snow Lion Publications. ISBN 1559391871. Wikimedia Commons has media related to Sand mandalas.